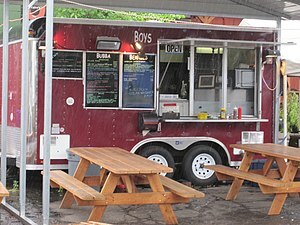 Food carts are restaurant on wheels. They come in all flavors and with clever names (Curry up now). They are showing up in office parks and business districts, catering to the lunch crowd. And that is the problem for traditional brick and mortar restaurant owners – the trucks are right at their doorsteps and eating their lunch (pun intended). The restaurant owners don’t like it! Let us look at this in two parts to see the disruption. As I am wont to do, let us start with customers. Customers/Customer Needs: Anyone with money to spend during lunch is a customer. Why are some willing to give up the sit down comfort and service of restaurants and try food carts? There is no one reason, there are always utilitarian and emotional reasons and it is the degree of intensity that varies for different customers. Some were hiring the restaurant just to satisfy their hunger and they are happy to hire any other service that does the same job faster/better/cheaper. Some hire the restaurant for the experience but not likely all the time. In some cases they may be hiring the food cart just for the novelty and experience. If you look at the comprehensive list of purchasing occasions you will find there were enough jobs for which the restaurants were hired only because there was no alternative. When food carts arrived the customers are happy to fire the inferior candidate and hire the new one. The Incumbents: The restaurant owners had a nice run. Their product was hired by customers for lots of jobs even though it was not the right fit. Do not get me wrong, there are many other jobs for which restaurants are the right fit and rightly capture their share of the value add. But the rest of their customers incurred higher transaction cost for the value delivered. These segments were right for picking by anyone. Restaurants were however only too happy to serve the same product at the same price to all their customers and now see that advantage vanish. “Our original business plan did not take into account these food carts taking away our customers”. Isn’t this a luxury every business would like to have? That is the core problem. Disruptions don’t telegraph their arrival. Uncertainties are the unknowables. You can’t ask for protection because of your failure to model these uncertainties. If disruptions these are the unknowables how can they model these? There is really only one way – starting with customer segments and asking what jobs are the different segments hiring your product for. If your product is not the best candidate for each one of those jobs it is currently hired for it will be disrupted. The flip side of my earlier statement, “anyone with money to spend is customer”, is , “anyone goes after that money is your competitor”. And they do that by doing the job faster, better, cheaper. If the customers hired your product only because of lack of alternatives are they really your customers to begin with? Your failure to focus on customer needs cannot be fixed with newer regulations to stop the disruptors. We all hear about customer loyalty and the need to focus on increasing loyalty. Loyalty cannot stop disruption. If you do not want to be disrupted it is you who should show loyalty – loyalty to the job your customer hired your product for, doing the job better than anyone else can.